I could have written that well over 100 times in the last seven years of penning this column alone. Come to think of it, I may have done it once or twice anyway. Forget about how many times he could have bitten the bullet over the last 40-odd years of his public life. After all, this is a man who was a functioning revolutionary freedom fighter/terrorist, whose base camp was smack dab in the center of the country he was threatening to reconstruct and/or obliterate for nearly half a century. This is tantamount to Osama bin Laden hanging out in Cleveland making his handy videotapes and masterminding the random car bombing. If you had told me ten years ago that Saddam Hussein and Slobodan Milosevic would be in prison, while Yasser Arafat died in a French hospital of natural causes, I’d have taken that action against vicious odds. Then again this is man best known for waging war, while winning a Nobel Peace Prize. He was born in Cairo, Egypt, but swore Jerusalem his birthright. He was pummeled in two major conflicts with the Israeli Defense Force, but still managed to maintain credibility with his people. He pretty much invented modern terrorism, but ran around shooting the peace sign at reporters. This is what we in the business call a lifer. I choose to call Arafat a survivor, and an enviable one at that. Damn enviable. Whether you loved him or hated him, it was hard not to give him that. He was a terrible thug. He was also a classic narcissist, claiming to fight for Palestine, negotiate a state, while grabbing as much face time on international news and free meals at the White House, but you never got the feeling this was viable without him running the show. He had Fidel Castro blood. He was full of himself, and, in the end, a miserable failure. Most of us learned of Yasser Arafat and his band of loons called Fatah, and later the PLO, at the 1972 Olympic games in Munich, Germany. Arab guerillas took hostage and later murdered 11 Israeli athletes, much of the drama unfolding on television with Howard Cosell’s nasal drone providing the gory soundtrack. It was the first Olympics I recall watching. Watergate followed this nicely, and my cheery life of cynicism was underway. Whether it was peace accords or killing innocents, Arafat was in the news and being cheered and the target of assassinations. He was just one of those people whose notoriety seemed as insane as his methods. But the PLO was just getting warmed up. By the early 1980s’ Arafat’s brand of freedom fighting nearly had all of Lebanon in flames, another ignominious defeat his worshippers chose to ignore and his enemies saw fit to let pass. Yet, death and failure did not deter Arafat. If anything, it was this kind of brutal mayhem that had people paying attention to the Palestinian effort to gain statehood in the first place; a resounding victory for terrorism, and a blow to sober reason and judgment. Of course, those were loftier concepts to swallow after the powers that be carved up the Middle East like a Thanksgiving turkey following WWII, concluding nicely with the U.S.A.’s recognition of the Zionist movement as Israel and the only sane nation in the region. This, of course, was nothing approaching sanity. Israel has been the home office for inhumanity and ultra-violence for thousands of years. Three monotheistic cultures forced to inhabit the same land they each considered their destiny, the Lord’s recipe for disaster. Forever wrapped in his trademark checkered kaffiyeh and handy desert fatigues, Arafat played the religious/cultural card well. Not unlike his successors today who use the Arab culture and Islamic religion to beat their megalomaniacal chests or corporate goons who hide behind the American flag. Blatant opportunists. History and the current globe are littered with them. But no one with half a brain bought it, least of all the myriad of Israeli leaders who were forced to beat back Arafat’s minions time and again, still unable to crush him completely. This was when Arafat went to plan B, negotiator for peace settlements, which was a rather interesting maneuver, since he had nothing in which to negotiate. Apparently unfamiliar with the way things work on this planet, Arafat developed what I call The Crazyman Theory. It is one rarely tried by those whipped in a war or sent packing by progress and gluttony like the American Indian, whose “I was here first” thing didn’t work out all that well. Arafat seemed to believe that since the Palestinian people, of whom he could not be included, mind you, had been living there for centuries, they were entitled to the land. He was also able to continue to carry rifles around and wave a fist, while keeping pace in the dignitary circuit. It was quite Al Capone of him, really. 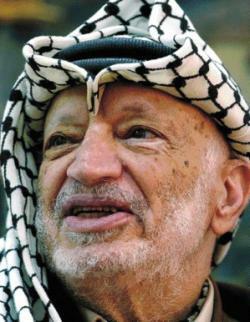 I always thought that was what I most admired about Arafat, his balls; a big scary pair. Rather fearsome in their enormity. But even these fleetingly triumphant moments ended in tragedy. After unconscionably winning the Nobel Peace Prize for signing the Oslo Accords with Israeli Prime Minister Yitzhak Rabin in 1994, an Israeli extremist assassinated Rabin, not unlike the shooting of poor Anwar Sadat after he was seen shaking hands with an American president and an infidel. This is simply because while Arafat put on the good face for the world, he was spreading hate and fear among his people, blowing up innocent women and children at bus stations and markets and dance halls. I’ve been to Jerusalem. You can’t spit without hitting an Israeli soldier. Yet, they only seem to be harmed as collateral damage in these monstrous acts of random violence. So while fighting for freedom may be humanity’s noblest act, murdering the innocent in cold blood is its most heinous. In the end, Yasser Arafat was a murderer, because the cause does not justify the means or the direction of those means. This does not bother the megalomaniac, and it did not sway Yasser Arafat. Whether it was peace accords or killing innocents, Arafat was in the news and being cheered and the target of assassinations. He was just one of those people whose notoriety seemed as insane as his methods. And now Arafat is dead, and no one seems to know what this will mean for peace in the region.